Is it a case of Darwinism in action or litterers killing an innocent animal? Last week, the goose named Scarlet was found ill at Waller Park and impounded by Santa Barbara County animal control officers. A veterinary team determined Scarlet had ingested baby wipes, balloons, and possibly other trash. 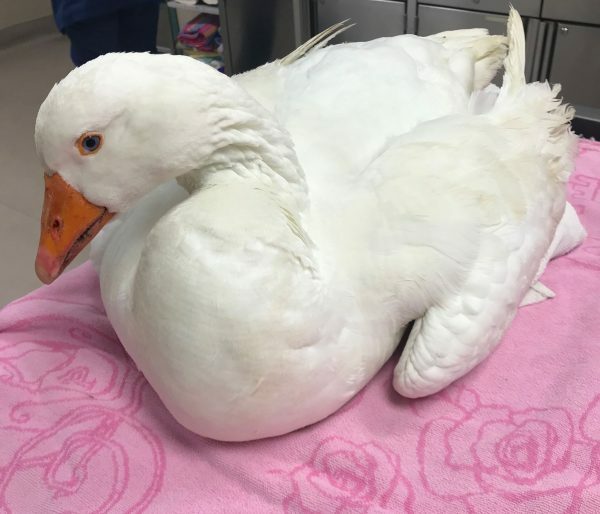 The goose needed extra support in order to pass the foreign objects, but Santa Barbara County Animal Services said in a Facebook post that Scarlet was expected to make a full recovery and be reintroduced to her flock. However, animal services announced in a post on Tuesday that Scarlet succumbed to a belly full of trash. The latex balloon penetrated the goose’s gastrointestinal tract, causing her to become septic. Pain medications were used, and Scarlet knew love before dying, animal services said. If only all the geese there would eat used diapers and wipes and Capri Sun bags etc., maybe Waller would be a nicer park. Geese cost practically nothing compared to government workers. Buy more geese! Get a grip….dont we eat those things? I mean geese, not baby wipes and balloons. Its time to Ban Parks.